The Nochebuena tradition of roasting pigs began in the Spanish Caribbean after the 15th century, although it was customary for Catholics to eat fish on Christmas Eve. 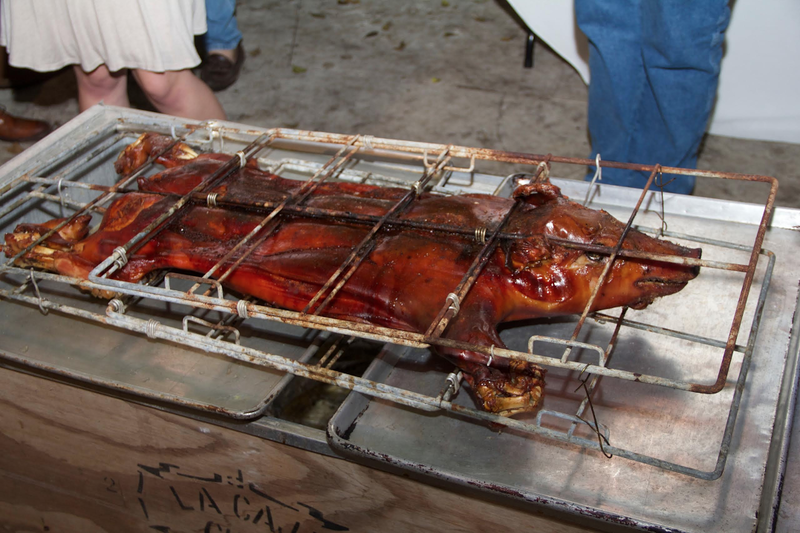 But Spaniards brought pigs to the Americas, and the tradition of roasting them continues today in many South Florida homes, including Lucila Jimenez’s. Jimenez is the matriarch of baking at Sweet Art by Lucila, a chain of cake shops in Miami. She came to the United States from Cuba in 1961. Last year I was lucky to join her Nochebuena feast. Lucila and her husband Andres host this gathering yearly for family and friends, including those whom they may not know very well but will not be going home for Christmas — as they too were welcomed into the homes of others during the holidays when they first arrived from Cuba. During Christmastime, her home smelled of butter, flour and sugar. It was warm from the ovens -- working overtime this season -- and carols were playing. Outdoors, smiling faces lined up for a myriad of dishes, among them “a little salad,” -- cumin-scented black beans, glistening rice, garlicky, melt-in-your-mouth yucca with olive oil -- and the piece de resistance: a 14- to 16-lb. pig roasting inside a caja china. The roasting of the pig is a slow, social event that takes hours of chitchat and work raking over embers and ashes. The family prepares the swine for days -- purchasing the pig, seasoning and brining it, preparing the carcass, tying it over hooks inside the caja china, lighting coals inside the wooden box, adding coal every hour and eventually flipping the beast over to crisp the skin. The result has the tender texture of pulled pork, but a slightly smoked taste that supports the animal’s gamey flavor. It is juicy and delicious. People fell into their chairs in silence. The hearty, spiced (though not spicy) food is just too good for small talk. So good, in fact, that a squeeze of lime to cut the fat later, I used my hands to snap a piece of thick, crunchy pig skin from a serving platter and decided to forego utensils. The pig is such an integral part of Nochebuena, and of Cuban culture, Lucila even collects it in figurines. She became simpatico with swine memorabilia many years ago, and has since been gifted so many that her home is a venerable shrine. During the holidays, pink four-legged creatures on her shelves wear Santa hats or have bows around their necks. Some decorate wreaths -- a testament to the warmth and sense of humor of the Jimenezes. 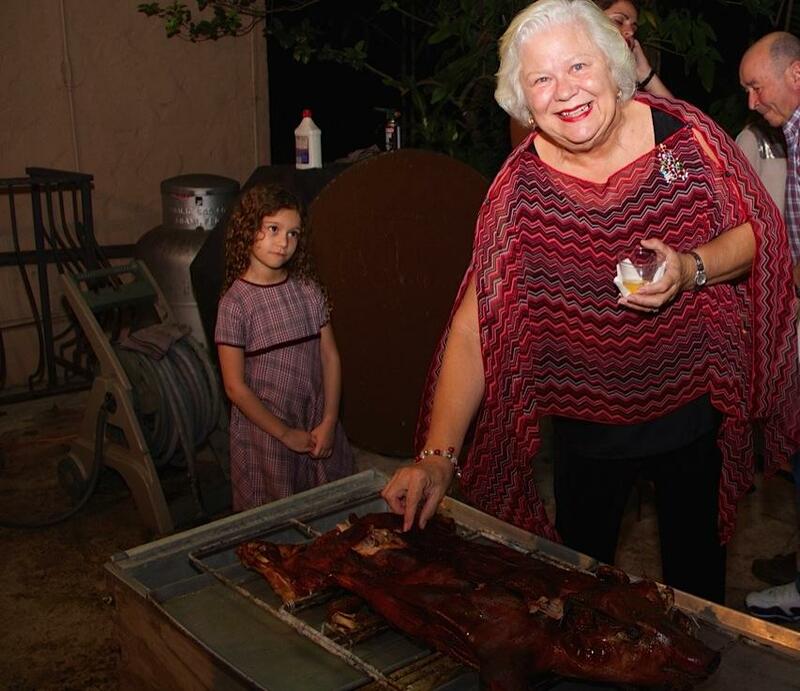 Matriarch of baking Lucila Jimenez and her Nochebuena roasted pig from 2013. After dinner, Lucila and one of her grandchildren led the group in singing “The 12 Days of Christmas.” The smell of cafecito slowly crept out of the house and perfumed the yard, promising that our stomachs would settle and the party would continue as guests leisurely made several stops on a tour of the dining room goodies, many of which coveted offerings from Lucila’s bakeries. Having lived mostly in Miami for nearly 30 years, it seems almost impossible that this was my first Cuban Nochebuena. I was away from my family for the first time during the holidays last year, and the Jimenezes opened their home to me. It was such a good night that I smell, taste and feel it as if it were yesterday. 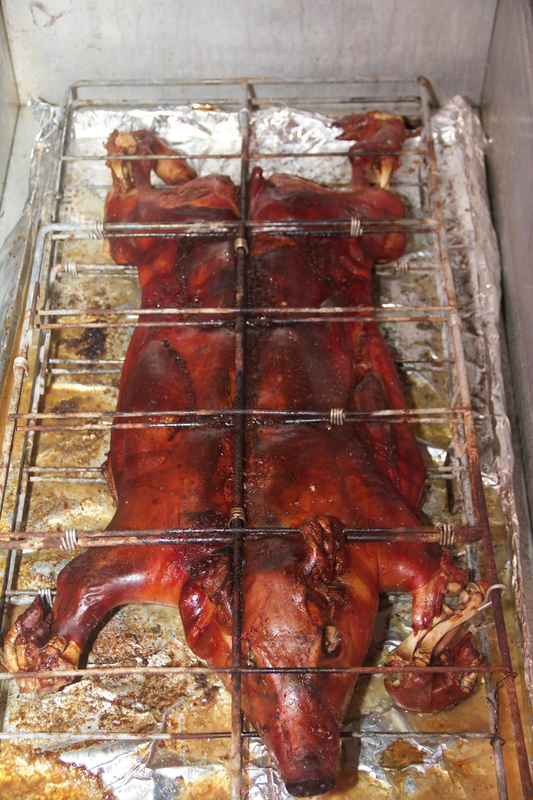 I was able to understand and appreciate why the roasting of the pig in a caja china went from being a substitute food in the 15th century to a heritage food in the 21st.